Those who can’t support their position on a controversial science issue with empirical research and independent studies—take vaccine safety rejectionists as an example—often buttress their opinions with the words “it’s scientific fact”. In popular use, the statement is used sometimes in jest and sometimes as hyperbole, but the intent is the same: “You can’t win this argument because I have science on my side” (just don’t ask me to cite legitimate research). We have seen dedicated opponents of crop biotechnology use these tactics. Questionable studies by marginal scientists? Offer up research by Gilles-Éric Séralini, computer scientist Stephanie Seneff or biological engineer V.A. Shiva Ayyadura. Controversial legislation? Vermont passed a GMO labeling bill that’s being challenged in court. Celebrity supporters? 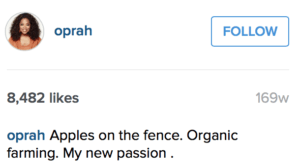 Doesn’t get much bigger than Oprah, Dr. Oz or the team of celebrity, organic-endorsing moms assembled by Just Label It’s Gary Hirshberg. These efforts have all gone a long way toward stirring unease about GM foods. When asked if they support labels for genetically modified foods, more than 90 percent of Americans have replied they think it’s a good idea. But these efforts would have gone no where without the promotion of anti-crop biotechnology viewpoints by journalists and bloggers. Ironically now, because of an attack campaign funded and launched by anti-GMO activists, we have an insight on how crop biotechnology opponents have coordinated their public relations efforts. In August, the anti-GMO, organic industry funded activist group U.S. Right to Know began releasing selective emails to sympathetic journalists that tried to build a case that crop biotechnology scientists were being financed by Monsanto to promote GMOs, and that the seed industry was coordinating their messages. It led to a slew of articles in the advocacy press, most notably by Tom Philpott of Mother Jones, a reliable critic of modern crop biotechnology, and a few mainstream media stories. The most highly publicized of the articles was an early September New York Times front page story, “Food Industry Enlisted Academics in G.M.O. Lobbying War, Emails Show,” in which reporter Eric Lipton presented what he apparently believed was a balanced view of the controversy over industry support for the pro and anti GMO viewpoint. He framed his article as if both sides of the GMO debate — scientists who support crop biotechnology and GMO opponents, mostly NGOs and journalists — equally compromised their ethics by working closely with corporations that supported their view points. But Lipton bungled the story by presenting a kind of false equivalency that scientists on both sides of this controversial issue were being financed in part by their respective industry supporters. The most damning information he could muster challenging the biotech science side was an unrestricted contribution of $25,000 by Monsanto to the University of Florida for science outreach–money since donated to charity. 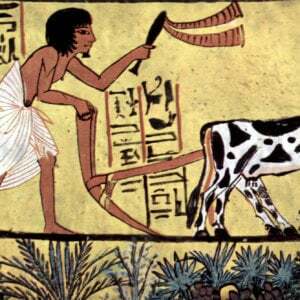 No biotechnology scientists took any industry handouts. As his counter example, well down in the piece, Lipton briefly cited Charles Benbrook. who until May of 2015 was an adjunct research professor at Washington State University churning out one pro organic, anti-GMO research project after another. Lipton wrote about Benbrook’s move from the Organic Center, a division of the Organic Trade Association industry lobby, to a position with WSU–an adjunct professor appointment for which the university contributed zero funds. Dr. Benbrook, who had served as chief scientist at the Organic Center, a group funded by the organic foods industry, resigned his job and sought a university appointment, he said. “I was working for an organization affiliated and funded by the industry, and people were just not listening,” he said. At Washington State, Dr. Benbrook was supported by many of the same financial backers, including Organic Valley, Whole Foods, Stonyfield and United Natural Foods Inc. 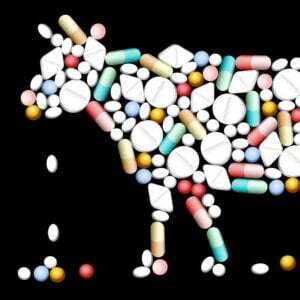 The companies stayed closely involved in his research and advocacy, helping him push reporters to write about his studies, including one concluding that organic milk, produced without any G.M.O.-produced feed for the cows, had greater nutritional value. Lipton missed the real story. While he highlighted a tiny grant to Florida plant scientist Kevin Folta to pay for travel and donuts, with no money going to research or even into university coffers, he did not disclose the fact that organic companies were not just “closely involved in [Benbrook’s] research and advocacy’; in fact they had financed 100% of his research while at WSU—hundreds of thousands of dollars—and have been his central benefactor for more than a decade. Lipton also did not disclose the troubling fact that the anti-GMO wing of the organic industry had often directly requested studies to support a pro-organic, anti-GMO position—which Benbrook then offered to deliver. How do we know this? Because a few weeks after the publication of Lipton’s report, the Times posted online a cache of Benbrook’s emails at WSU that it had secured in a FOIA request. The GLP has a background report on Benbrook’s career here. GLP contributing writer Julie Kelly has an analysis of Benbrook’s direct financial relationship with the organic industry, including his ties to Gary Hirshberg, who has led the national campaign promoting mandatory labeling of GMOs. And Australian reporter Colin Bettles has an expose of Benbrook’s offer to produce a ‘pay-for-play’ study that would challenge the safety of GMOs and promote the organic industry—if activists would foot the bill for the study and pay him $100,000 to “ramrod” through this “independent” study. 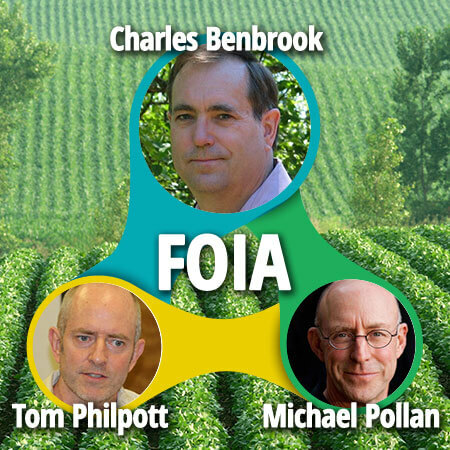 The Times‘ emails, and a new set of Benbrook emails released just last week in response to a separate FOIA request, offer a compelling narrative on how the organic lobby mobilizes its troops of pro-organic journalists, professors and NGOs (or in Benbrook’s language “the A-Team”). These emails go part of the way toward explaining how the organic food industry consistently manages to garner sympathetic ‘white hat’ publicity as the beleaguered David fighting the Goliath of Big Ag despite overwhelming scientific evidence that organic foods offer no nutritional or ecological advantages but rather are much more expensive for consumers. But just as important, the Benbrook emails illustrate his sway over science communicators— journalists and bloggers who the public depends upon for independent reporting. Consider for instance the coverage of Benbrook’s controversial 2013 study claiming that organic milk is healthier than conventional milk. The email record shows that Benbrook led what amounted to a guerilla style promotion of the study backed by a $120,000 media promotion grant from the organic industry—a fact never disclosed by Benbrook or by reporters who ended up wiring glowing articles about his study. Washington State University compounded the ethically questionable promotional campaign by arranging for Eric Sorensen, a top WSU public relations spokesperson, to oversee the logistics. The sheer volume of people the anti-GMO pro-organic reps briefed using industry backed talking points is astounding. And who rallied the troops personally? Benbrook. And they delivered. Pollan promoted the “independent” study feverishly to hundreds of thousands of his followers, and has since often commented favorably on its much disputed findings. Philpott wrote a story — “Organic Milk Proves Higher in Healthy Fats” — that resembled an organic industry news release. 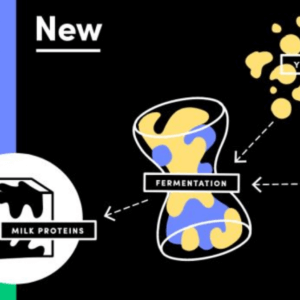 In a recent study published in the peer-reviewed PLOS-One, a research team led by Washington State University’s Charles Benbrook found that organic milk delivers significantly healthier fats than its non-organic counterpart. The takeaway seems to be: milk from grass-fed cows seems to have more healthy fats then conventional milk. And for consumers, the organic label is a good shorthand way to find milk from cows eating the good stuff. Benbrook and his organic industry PR partners also sealed support from the likes of self-appointed food expert Robyn O’Brien, as there are numerous emails documenting their contacts. They also reached out to many other high profile health, nutrition and general science reporters and web posters. Note that next to many names there is the phrase: “DONE, Chuck”. Many other reporters at various, large news outlets such as Clay Masters of Iowa Public Radio; Kathleen Masterson on NPR, Elizabeth Weiss and Nanci Hellmich of USA Today, Maria Rodale of Huffington Post, Marion Burros, Mark Bittman and Nicholas Kristoff of the New York Times, Alan Bjerga of Bloomberg and Eryn Brown of the LA Times were also contacted. According to Benbrook’s emails, they were not just contacted to provide background on the study; many were recruited to defend and promote this study, including making strategic comments on social media. Related article: Should you pay as much as a 300% premium for organic foods? Avoid EWG's 'dirty dozen'? Many of those contacted did subsequently report favorably about the study, and almost no one disclosed either their solicitation by the organic lobby or the publicly known fact that all of Benbrook’s research and this study in particular was financed by the organic industry. 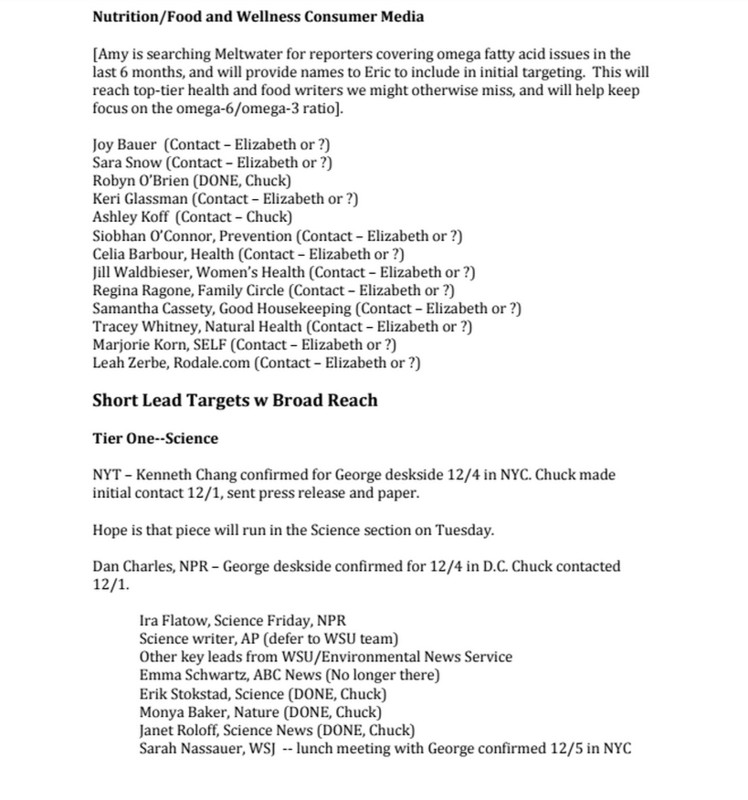 Some of these contacts have shown biases in their reporting on the organic-GMO feud, but most would be understandably horrified to find they were on this PR outreach list. Gary Ruskin and Tom Philpott, in their recent attacks on journalists based on Kevin Folta’s emails, automatically assumed that anyone who interacted with the those sympathetic to crop biotechnology were automatically biased and corrupted; that’s an unfair smear, and there is no reason to believe that every one, or even many, of the people on these organic industry lists were corrupted or corruptible. Most are just hard working journalists who would welcome information outreach from any source, as would any good journalist. But not all. Of this group, perhaps the most problematic involvement came from Michael Pollan and Tom Philpott. Pollan has long promoted Benbrook’s often one-sided research. Here is his Tweet from 2012 hyping Benbrook’s controversial attempt to explain away a state-of-the art Stanford University meta-study that found organic foods offered no nutritional benefits over conventional foods–research that challenged years of pro-organic claims and propaganda. Ironically, Tom Philpott presents himself as an ethical Rottweiler on science and journalism. 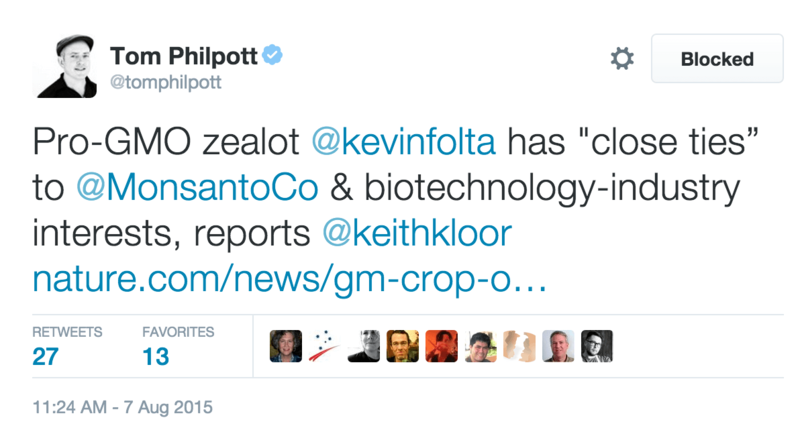 Two months ago, he was issuing multiple Tweets decrying the “close ties” of “Pro-GMO zealot Kevin Folta” to Monsanto. Hmm. What about the close ties of pro-organic industry “zealot” Tom Philpott? In fact, the Benbrook study was not well-received but widely dismembered by independent scientists. 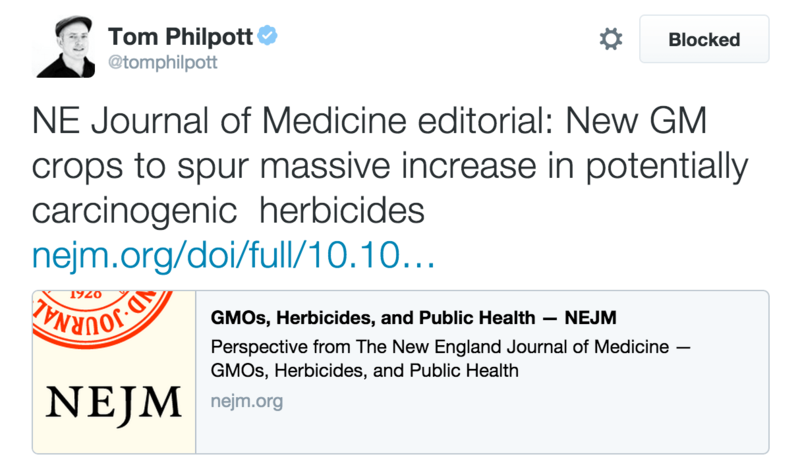 Philpott’s biases, and his unrelenting promotion of Benbrook as a whistle clean scientist, was also on display this summer when he hyped an opinion piece co-authored by Benbrook dissing GMO crops published in the New England Journal of Medicine. Philpott again failed to mention that all of Benbrook’s funding comes from the organic food lobby — and that he himself has worked hand-in-glove with pro-organic, anti-GMO lobbyists. Perhaps the most egregious example of Phlipott’s compromised ethics is illustrated by an email sent to Benbrook by Dr. Bronner’s Soap founder David Bronner in September 2014, five weeks before Oregon was set to vote on whether to institute mandatory labeling. Bronner had given millions of dollars to anti-GMO groups and mandatory labeling efforts, including in Oregon. Clearly desperate to influence the vote, he had written an advertorial that distorted the science of GMOs and promoted some of Benbrook’s much-criticized claims. Bronner had placed the propaganda ad in a number of non science publications, but was furious when two science journals, Scientific American and Nature, both saw it for what it was–an attempt to manipulate an election by promoting questionable science. That’s where Tom Philpott enters the picture and comes to the rescue. Bronner’s solution, according to this email he sent to Benbrook: recruit Philpott to carry his personal message that GMOs are dangerous and mandatory labeling was necessary — all coordinated closely with Bronner as part of his national campaign set to roll-out on October 20, two weeks before the election. Every journalist welcomes being pitched a story; nothing untoward about that. But in this case, according to Bronner’s email, Philpott agreed not only to write an article promoting Bronner’s point of view, but to publish it on a specific date to coordinate with a national anti-GMO mandatory labeling effort—and to coordinate everything with one of Bronner’s public relations operatives. We are going to break this oct 20th same day New Yorker and scientific American ads drop with Tom philpott and our own our pushing hard. … We will definitely blow upon Oregon media and expect will get national play too. Tom Philpott and Mother Jones were in Bronner’s pocket, agreeing to not only write a story but to time it to influence an election. And Philpott delivered. On October 20, just as Bronner and his PR operatives planned, Philpott’s wrote a scathing story for Mother Jones excoriating editors at Scientific American and Nature for—get this—their questionable ethics and journalistic fairness for not carrying Bronner’s propaganda piece. Philpott hit all the talking points in his story and provided a helpful link to the advertorial now embedded on a Mother Jones page for public viewing. No where did Philpott acknowledge he furthered a propaganda effort on demand, timed the date of publication of his article with its prearranged message in coordination with a corporation’s public relations operative as part of a national campaign, all to influence a public vote in Oregon. That’s a gross breach of journalistic ethics—and a fireable offense in every responsible mainstream newsroom in the world. But not at Mother Jones. 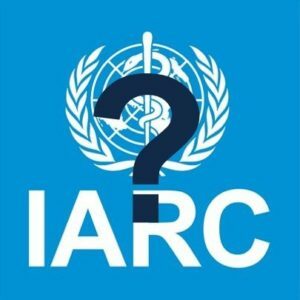 Pollan, Philpott and some of the other members of the A-Team are long-time, established, integral parts of the organic lobby’s strategy to smear crop biotechnology and mainstream independent scientists, and the impact of their efforts throws a dark cloud over science itself. They appear to be ready on a moment’s notice to promote and defend anyone’s work that conforms with their selection bias against GMOs—with talking points provided, conveniently, by long time science ideologues. Or they will savage critics of organic foods. But this is not just about tweets and poor journalism. Biased journalism creates a false equivalence on the science of GMOs. The attention Benbrook used to receive because of his position at Washington State and amplified by these prominent journalists made his research and his opinions seem far more credible than if he was merely an organic consultant—as he is now. There are few globally prominent crop scientists who raise serious safety concerns about the technology; almost all the antis “science” rested on Benbrook’s organic-supported shoulders. Benbook’s A Team—the ones who cooperated in promoting his views rather than just reporting on them—also helped create the illusion that there is strong science establishment support for the health and ecological benefits of organic food, when there is actually a consensus that there are few unique benefits. They manufactured false balance—and the established media has allowed them to get away with it. The alleged misdeeds by Folta and other other scientists mentioned by the Times? The promotion and education of the public on the science of biotechnology—which coincidently is their job. They are mandated by land grant universities to engage equally with all stakeholders: consumers, students, professors, government and corporations doing ground breaking research; in other words, they would be in violation of their professorial contracts if they did not work with companies like Monsanto—and disclosure those relationships, as Folta and others properly did. To demonize independent professors for doing fulfilling their mandated responsibilities is to misunderstand the very nature of science and research. Sure science is a search for knowledge, but what good is knowledge if it is not shared with others, if tangible products do not result from it? This is what real science advocates do, they go around the world getting people excited about science. Not for glory and not for money—almost all of these scientists under fire made a fraction of what Benbrook made with his organic funded research job and his lucrative consulting practice that included Whole Foods and other big name clients—but because it is what they want to do. In the cold light, what’s the legacy of the campaigns by Benbrook and compliant journalists? They formed an informal public relations team funded by a multi-billion-dollar industry, creating a faux, legitimate-sounding professorial position at a reputable institution so that ideologically aligned journalists could quote his work as if he was an independent expert. Now which group is suppose to have the conflict of interest again? Nicholas Staropoli is a research associate for the American Council on Science and Health. He has an M.A. in biology from DePaul University and a B.S. in biomedical sciences from Marist College. Follow him on twitter @NickfrmBoston.